This contest started on 4/4/19. This contest has a winner. ***** Win A $15 V & S Italian Deli Subs and Pasta Gift Burger King Gift Card. Jeff Eats got a $15 V & S Italian Deli Subs and Pasta Gift Card to give to one of you guys! The $15 Gift Card is good at V & S Italian Deli Subs and Pasta, 2621 North Federal Highway, Boca Raton, Florida 33431 (561) 395-5206. Check menu/prices/info- vandsdeli.com. V & S is one of the best sub joints that Jeff Eats has had the pleasure to do business with for the past 25 years! No bs- here, can’t recall even one single “item” that wasn’t off the chart delicious! ***** V & S Italian Deli Subs and Pasta, 2621 North Federal Highway, Boca Raton, Florida 33431 (561) 395-5206. V & S is a small Italian takeout-deli located in Boca Raton. The joint has been around since 1985-and has the full gamut of cold and hot subs/sandwiches/salads/Italian entrees/pasta dishes. On the sub price-front, figure on spending $6.50-$8 depending on whether you get small-or-large. A recent outing had Jeff Eats and Mrs. Jeff Eats “sampling” some subs and I gotta tell you guys- absolutely top-shelf! Delicious fresh baked hard crust bread stuffed with great “fillings”- just that simple! Like I said two seconds ago, V & S is basically a takeout (handful of wall counter seats) so don’t planning on staging big weddings, bar mitzvahs or baby namings there! The joint is open Monday-Friday 9am-6pm, Saturday 9am-5pm, Sunday 10am-3pm. I love their subs. Been eating them for 16 years. Have heard from multiple people (including Jeff Eats) that V&S is the best! Would love to try it for myself. For an amazing “Authentic” Italian experience I’m telling you to check out V & S Deli, but be warned you’ll wait for this deliciousness.. and its soo worth it, their bread, their sauce, mama mia so good…. V & S is an absolutely terrific sub joint. Ive been a customer for 9 years and I can tell you they really make a great sandwich. This joint is an absolute must try. Its a good sub, if you like a hard roll. 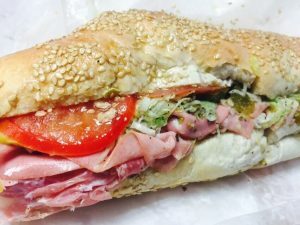 Omg Hands Down The Best Italian subs in town ! !